Time is just flying by...I can't believe it's the last day of January. Christmas decorations. Shhhhh....Please don't tell anyone. lol. Today I have a quick and simple card that I made using the circle dies from Heartfelt Creations, the paper from the Singing in the Rain Collection and the flowers from the Wildwood Cottage Collection. Other Products: Pearl White Metallic Cardstock, Green Cardstock, Cuttlebug Spots and Dots Embossing Folder, Dimensional Tape, Sponge, Sparkle Sheer Shimmer Spritz, Big Shot Plus, Water Mister, Sponge, Hot Glue Gun, Misti, Dark Blue Jute. Instructions: Card size is 4 1/4” x 5 1/2”. Cut the pearl metallic cardstock to 4 1/4” x 11”, score at 5 1/2” to create an A2 tent fold card base. Cut a second piece of pearl metallic cardstock 4” x 5 1/4”, place it in the embossing folder and run through the die cutting machine. Adhere to the card base using dimensional tape. 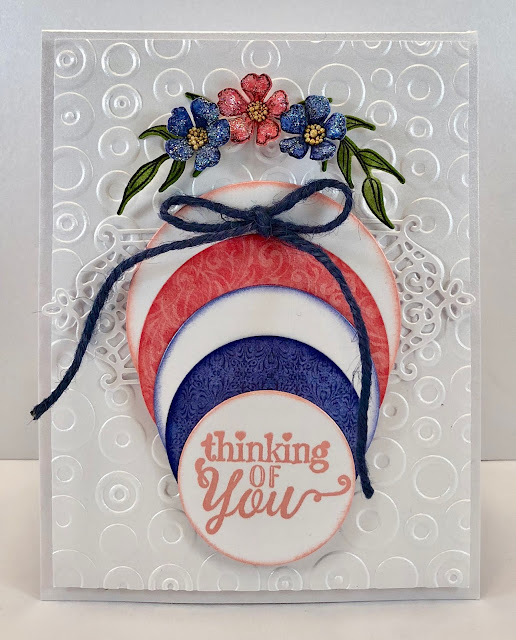 Using the Large and small Circle Basics dies, decide on the sizes you want to use for your circles and cut the largest, smallest and middle circles of your choice from pearl metallic cardstock. Cut the second largest circle from the Coral paper in the collection and cut the second smallest circle from the blue paper in the collection. Cut the Window Box Elements Die from Pearl metallic cardstock. 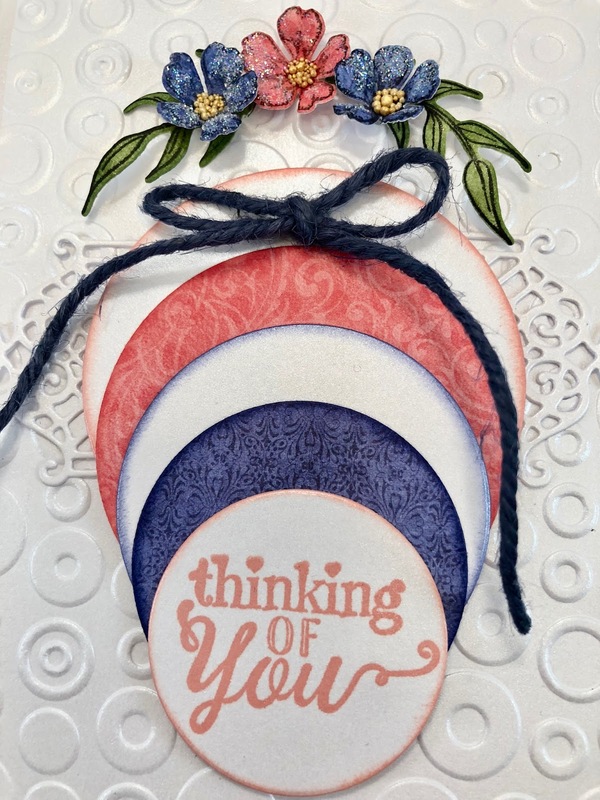 Stamp the Wildwood Florals on the blue and coral designer papers from the collection with Tuxedo Black Ink, spritz them with water, place them face down in the floral basics mold and run through the die cutting machine. Use the stylus from the Deluxe Flower Shaping kit to press down in the centers. When dry, sponge with dries clear adhesive and sprinkle with glitter. Add a little glue and Heart of Gold Prills to the centers. Stamp the leaves from the Rain Boots and Blossoms Stamp set on green cardstock with Tuxedo Black ink, diecut using the coordinating die, spritz with water and shape with the Deluxe Flower Shaping Kit. Spray with Sparkle Sheer Shimmer Spritz. 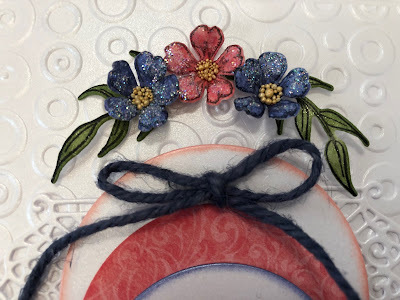 When dry, adhere the leaves and flowers to the card base using a hot glue gun. Tie a bow with dark blue Jute and adhere to the largest circle as shown. projects created by the fabulous Design Team! This is so cute with those papers and the circles with that circle embossed bg as well! And Christmas...it is typical for me to still have Christmas up come Valentines, LOL! Thank you so much Robin! I finally finished packing up Christmas over the weekend. Lol.